This very special Phoenix Katana Sword comes to us from the Ryumon forge. This fully handmade sword starts with a blade of 1065 high carbon steel. The blade is sharpened and polished by the masters at Ryumon Swords and the handle is wrapped in top grade rayskin and is double pegged for security. The saya however is what steals the show here as the wooden saya is red and is engraved and hand painted with a beautiful phoenix scene which must be witnessed to be believed! The picture itself is beautiful, however, to see it up close and witness the beauty personally is quite a treat. This is an excellent Katana Sword that you can buy today at almost 30% off! A hand forged 1065 high carbon steel blade with bo hi and is fully sharpened. The Phoenix Katana has an iron tsuba with front/back Crane and gold details on it. It has a black Japanese cotton tsuka ito and top grade rayskin wrapped handle which is double pegged and adds extra security for you. The Ryumon Phoenix Katana has a beautiful black lacquered wood saya with hand engraved and painted Phoenix scenery on it. It has a black knotted sageo and a certificate of authenticity wall scroll, a maintenance kit, a reference kit AND a sword bag! How can you go wrong getting a sword like this, with all the extras and all the savings at the same time! Why wait, buy yours today as these beauties go fast! 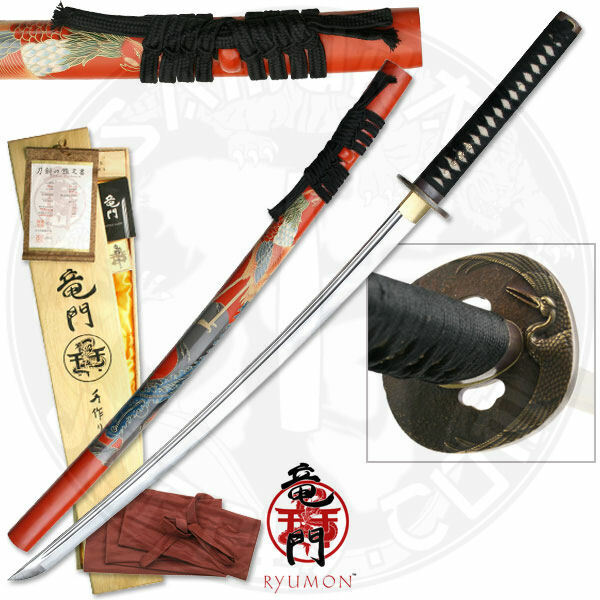 This Ryumon Sword is on sale for over 25% off the regular price and qualifies for a 30 day money back satisfaction guarantee! Purchase this sword now and get an amazing sale price and peace of mind knowing that SamuraiSupply.com stands 100% behind their products!